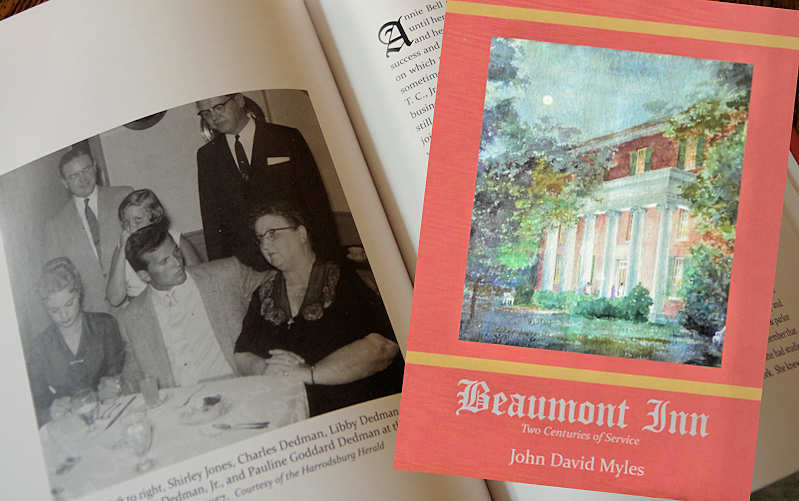 After many years of research, the book Beaumont Inn: Two Centuries of Service by John David Myles traces the evolution of Kentucky’s oldest family-operated inn. The book release kicks off the 100th anniversary celebration of the inn and the 200th anniversary of this location welcoming guests. This 125-page hardback book by historian John David Myles is the first written documentation of many oral accounts and recently discovered tidbits about the beloved American landmark operated by five generations of the Dedman family. Located in Kentucky’s oldest town, Harrodsburg, the journey begins some 200 years ago as the first tourists journeyed to the natural mineral springs. In fact, the summer of 1808 welcomed 1,500 guests in cabins and modest rooms. Read endless interlocking stories of the springs and the creation of Kentucky’s trailblazing college for women. After the college closed, the Dedman family journey began as a graduate-turned-teacher bought the grand building and transformed it into the landmark inn and restaurant that opened in 1919. Read how it became one of the top culinary and bourbon destinations in the country. Their commitment to hospitality and known-for dishes such as yellow-legged chicken, corn pudding and two-year old Kentucky country ham led them to win the prestigious James Beard Foundation American Classics Award in 2015. Also, their early years of distilling in the Bourbon capital of the world led to fifth generation Dixon Dedman’s return of Kentucky Owl Bourbon Whiskey, about 135 years after his great-great grandfather first distilled it. Constructed in 1855, the present Main Inn was a school for young ladies known as Daughters College, later becoming Beaumont College until 1916. Today, visitors are welcome to tour the first floor of the Main Inn to see a fascinating collection of historic photographs, artifacts and antiques. This book accompanies the recent release of the 6th version of the Beaumont Inn Recipes Cookbook. Purchase the book at the Inn’s gift shop or order online from the inn for $28. Beaumont Inn is Kentucky’s oldest family-operated bed and breakfast, with 31 guestrooms. In addition to the historic Main Dining Room, it is also home to the Old Owl Tavern, Owl’s Nest Pub, spa and gift shop. Read a short history of the inn. John David Myles is an attorney, former Circuit Judge, and preservationist. He has written and lectured on architecture for the Filson Historical Society and prepared historical and architectural reports on a number of southern hunting plantations for Plantation Services, Inc., in Charleston, South Carolina. Myles has also consulted on numerous restoration and renovation projects. His Historic Architecture of Shelby County, Kentucky 1792-1915 received the 2017 Samuel W. Thomas Book Award from the Louisville Historical League and a 2017 Publication Award from the Kentucky Historical Society.